“A novel as easy to read as the latest bestseller, No Country is a rousing adventure made up out of the blood and guts and dreams of people on three continents and nearly 150 years of troubled history” (Alan Cheuse, NPR). In the poverty of rural Ireland in 1843, Padraig Aherne and Brendan McCarthaigh grew up as brothers, inseparable, even when Padraig falls in love with their beautiful classmate, Brigid. But when Padraig makes a dangerous mistake that forces him onto a ship bound for India, and the deadly potato famine sweeps through their tiny village, Brendan is left alone to care for his best friend’s child, an infant daughter Padraig never knew he had. Eventually, Brendan flees with her aboard one of the infamous “coffin ships,” to begin a new life in America. As Brendan’s and Padraig’s two family trees take root on opposite sides of the world, their tendrils begin to intertwine, moving inexorably toward a disastrous convergence more than a century later. Unfurling against the fickle backdrop of history that includes terrorism on the Indian subcontinent, an East European pogrom, the Triangle Shirtwaist fire in New York City, and the terrible intimacy of a murder in a sleepy New England town, the fallout from lives torn apart in No Country smolders for generations. This reading group guide for No Country includes an introduction, discussion questions, ideas for enhancing your book club, and a Q&A with author Kalyan Ray. The suggested questions are intended to help your reading group find new and interesting angles and topics for your discussion. We hope that these ideas will enrich your conversation and increase your enjoyment of the book. In 1843, in County Sligo, Ireland, strong-willed Padraig Aherne sets out for Dublin to seek news of the political leader Dan O’Connell and his country’s ongoing fight for independence from the British crown. Amid the melee of the political uprising in the city, Padraig is involved in a lethal accident. He has no choice but to assume a new identity and board a ship owned by the East India Company headed for the Orient. What Padraig does not know is that his girl back home, Brigid, is pregnant with his child. As Padraig makes a life in India, his best friend, Brendan, is raising Padraig’s daughter in Ireland. And when the Irish potato famine hits, Brendan and the young girl are faced with the choice of immigrating to the New World or starving. So begins a family saga that spans three continents and five generations. No Country is an expansive tale—filled with instances of fate and questions of identity—that makes inquiries into the meaning of family, cultural identity, love, and how we make connections across barriers of language and land. 1. How much of your own family history do you know? How far back can you trace your generations? Do you have immigration tales similar to the Ahernes’? 2. When Padraig heads to Dublin to await news of the political leader Dan O’Connell, he feels impending change. “I now felt I was standing on a stretched skin, a drum waiting to be thrummed. I was ready to wake to a different sky, a different earth. . . . I felt Destiny was sending me an intimation of death or glory, and I would need to step out.” (p. 44) Has there ever been a time when you felt this kind of impending change, either political or personal? 3. Many of the characters in No Country are concerned with fate and the role of fate, or destiny, in their lives. Do you believe in fate? 4. What do you think of Maire Aherne’s chapter (p. 98), written in her distinctive voice as she lies dying? Did you relate to any of her thoughts as she contemplated the span of her life? 5. When Brendan is on the ship bound for Canada with Maeve, the passengers begin singing old Irish ballads. Discuss the role of song here. What is the role of song in keeping one connected to home? Can you think of other examples of this? 6. Padraig Aherne’s grandson, Robert, who was born in Calcutta, contemplates his hybrid identity. “What would we Anglo-Indians do . . . if a time came when the world forgot to scrutinize the exact text of our skin? Would we go home, wherever that home might be?” (p. 207) Is Robert both Irish and Indian? Is he more one than the other, or is he not fully either? Are you a mix of two (or more) cultures or ethnicities? 7. Robert’s first love, Queenie, is a beautiful and dramatic young woman. She tells Robert, “I cannot help what I want, Robert, all the things that I want to be and where. Even if I must give up something precious.” (p. 251) What is the something precious she is speaking of? Do you sympathize with her choice? Have you ever had to make such a sacrifice? 8. Robert makes a choice of his own and joins the British Police service. “I want to be a part of those who govern,” Robert tells his outraged father. “I don’t forever want to be part of the ruled.” (p. 256) Can you relate to Robert’s impulse here? Do you think his decision is justifiable? 9. Discuss the title, No Country. What does it mean? 10. What did you gather was the nature of the relationship between Maeve’s Papa Brendan and Mr. Livesey when Brendan and Maeve were living on the Braithwaite farm in Vermont? How do you think Maeve understood the relationship? 11. Have you known contentious mother-daughter relationships like Maeve’s and Bibi’s? Have you known a mother to betray her child the way Maeve did when she neglected to give Bibi the letter from Frankie? And have you known someone to have a change of heart and attempt to make amends in the way Maeve did? 12. Kush often feels the spirit of his deceased twin brother, Laub, and sees apparitions of him at times. Do you believe that the living can sense the presence of the dead? Do you think Kush is actually feeling Laub’s presence in these moments? 13. What about the young man Bibi runs into (twice) in the streets of New York? What do you make of him? 14. Kush and Bibi (on separate occasions) see hawks flying high overhead, as if observing them, both seen by them on days when great transitions are about to take place in their lives. Looking back on our own lives, do we ever feel any such foreshadowing of events? 15. What did you make of the lines of poetry at the opening of each section (“for every tatter in its mortal dress” )? What do they mean to you? Do they add up to a whole? 16. What did you make of the Swint family—Billy, his abusive father, and his mother? And what did you make of Billy’s mother refrain, “Oh, love, is that you?” (p. 511) when her husband beats her? 17. At the end of the novel, Devika’s Grandpa Robert tells her, “You and Neel are going to be the keepers of this letter,” referring to a letter written by his ancestor, Padraig Aherne. And Devika understands that he is “letting the stories of his life flow into ours.” (p. 545) Do you have stories in your own family that are passed down through generations, and that you feel are important to pass on to the next generation? 1. Do some genealogical research of your own using one of the websites below, or any other resources you can find. Research your own ancestors and how they originally came to America. Share your findings with the group. 2. Food is a big part of the cultural identities of the characters in No Country. Cook an Irish-Indian feast, based on some of the foods mentioned in the novel. You could look at the following websites for ideas for a hybrid meal. 3. Draw a family tree of the characters in No Country so that you can see the connections among the families and generations. Include notations about where each was born. Be creative. Use art supplies, cut things from magazines. Create a visual representation of the relationships. How much historical research did you do for the novel? What did the process entail? In a single phrase, a great deal! But I was constantly careful not to let the research burden the telling of the story. Let me explain. I needed to do different kinds of research into various aspects of No Country. But the primary part of my research involved nineteenth-century rural Irish society, and specifically the contemporary experience of the onset and the deepening crisis of what came to be called The Great Hunger. But that was only one of many areas of research, great and small. I felt that to do justice to the narrative, I needed to do serious research on the so-called famine ships and their various, and occasionally tragic, histories. I actually threw away a swath of the second draft in order to include the iceberg episode—which is based on an actual incident; I spliced in the despicable conduct of the captain and the crew from yet another incident. Apparently even minor elements in No Country needed intensive research. For example, in narrating Padraig’s journey to India, I felt it incumbent upon myself to learn about maritime customs and schedules of East India Company ships of that period. What may seem bizarre and outlandish, such as the man swinging at the end of a hook, a sight that Padraig sees from the ship and that plays a role in Padraig’s survival is—or should I say, was—a real occurrence in the Charak festival honouring the Hindu deity Shiva at the end of summer, enacted in the searing haze of the late afternoon. I had witnessed one in my childhood—but nowadays, the ceremony is enacted without the deadly hook, using ropes alone. But anthropologists have studied and recorded the earlier, and ancient, practice. Likewise, on land, for the sake of verisimilitude, for the streets of 1843 Dublin or early twentieth-century New York, I closely examined contemporary photographs. For example, Jaeger’s was a fancy shop on fashionable Grafton Street—which, I discovered from contemporary Irish newspapers, was partially lined with wooden planks to keep down the noise and dust for the convenience of the affluent shoppers. I felt that same frisson of surprise as Padraig Aherne did at this discovery, for at the time few huts of the Irish poor had much beyond packed dirt underfoot! It took about four years of immersion for me to re-create the realities of times and places in No Country. And as I revised, I discovered the lacunae, visual and sensory, that I needed to fill in—by more research and reading. The list of products being advertised in Irish newspapers of the 1840s supplied many tiny details, for example, and so did old photographs and newspaper items for the sections set in early twentieth-century New York and Bengal of the 1940s. There is such a vivid sense of place in this book—whether Ireland, India, or New York. Does place have a visceral effect on you? Does it affect your writing? I absolutely believe places have personalities; the bustling sidewalks of New York’s Hell’s Kitchen in 1911 is as far as one can go from a tranquil farm near Lake Champlain in Vermont. A politically unquiet small town by a roiling river in India is a world away from the majestic rise of Ben Bulben with its fog and Atlantic rain. I spent many hours, often with a magnifying glass in hand—like Brendan Aherne—peering into contemporary photographs of early Victorian-era cityscapes of Dublin, and at Irish landscapes of that period. For example, Jaeger’s was one of the finest shops on Grafton Street in 1843 Dublin! This is also what I did at photographic archives of India in general, and Calcutta in particular, for use in the later segments of my novel. I mourn the destruction by fire of the extensive and irreplaceable photo archives of Bourne & Shepherd in Calcutta which I had the good fortune to look at years ago. How did you decide how to handle the jumps in place and time? Did you create any charts or diagrams while writing? During the four years I took to write the draft of No Country, I had the uncanny sense of the various parts of the narrative suspended over me like a gigantic mobile—yes, very much like one of those huge Alexander Calder ones—and I knew how the various parts counterbalanced each other. I had vivid pictures in my head, and when a new image occurred to me, I would sometimes roll out of bed even in the wee hours and scribble it in my ever-present journal. No matter what I was doing, the story was a mosaic of coloured glass through which I saw whatever reality I needed to live in and deal with in daily life. I imagined aspects of the characters’ backstories which do not come into play in the novel, and I know what happens to them outside the scope of this novel; for example, I know exactly what happens to Frankie Talese. I am afraid that readers will have to wait for my next novel to find out. The novel is told in alternating first-person points of view. Was it a difficult transition to make while writing, going from one character’s voice to another when starting a new chapter? I found that I absolutely needed to take time out, sometimes days, sometimes a few weeks between certain sections, since I needed, like an actor, to get into the next role. This is not to say that I wrote or revised everything in narrative chronological order. Oddly enough, I found writing the women’s voices less difficult, for I found them commanding the flow and emotional directions of the narrative. Some characters, particularly Madgy Finn, wrote themselves into the narrative, in ways that I had not consciously anticipated or thought out. I realized that I could never have deliberately planned how she serendipitously re-enters the narrative after Maeve and Brendan have left Ireland—and even in the final moments of Maeve’s tragic life. Queenie is a fascinating, beautiful, and tragic character. Is she based on anyone in your life or in Indian history? Yes, Queenie is tragic. She is based on a real-life character; Estelle O’Brien was born of an English father and a poor Indian mother. Estelle—like Lena Horne in America—passed herself off as white. With the help of a rich patron, young Estelle did manage to leave Calcutta for the film studios of Nice, France. Estelle O’Brien changed her name to Merle Oberon, and after moving to California, she acted with some of Hollywood’s famous stars, most notably opposite Sir Laurence Olivier in Wuthering Heights. She was romantically involved with Leslie Howard and David Niven, but she married the movie director Alexander Korda, and subsequently the Italian multimillionaire Bruno Pagliai. She won the Academy Award for Best Actress for The Dark Angel (1935), owned a fabulous house and estate, and became a socialite who was befriended by the likes of Queen Elizabeth II and Prince Philip. It is also true that she began her stage career in an amateur production of A Midsummer Night’s Dream in Calcutta. Estelle O’Brien never acknowledged her Anglo-Indian heritage and girlhood in Calcutta (her romance with Robert Aherne is my invention), and fabricated for herself a fictitious biography of having been born of English parents in Tasmania. She was devoted to, and was always accompanied by, her dark-skinned biological mother whom she passed off as her maid. Her continued deception was not without tragic consequences; some years after her mother’s death, when her sister was dying in dire poverty in India, stricken with a terrible bleeding disease, Merle Oberon did not send money so that journalists would not be able to connect her to the dark sister she had left behind. In any case, after Merle Oberon’s death, journalists and biographers did connect the dots, but she never acknowledged her mixed ancestry in her lifetime. What does the title No Country mean to you? Did you consider other titles for the novel? Yes, I did. When I was first writing this many-braided novel about diaspora, identity, hybridity, I had thought to call it Home. Simple as the word was, it lent itself to several shades of meaning. But then the formidable Toni Morrison published her book of that name. And oddly enough, I was already looking for some other, more layered, title. Much of the novel is about storytelling. Were you thinking about the art and the history of storytelling across cultures while crafting your own story? Do you see Indians, Irish, and Americans as having different ways of telling a story—or stories having different forms, roles, or purposes in the three cultures? I was born in a culture of storytelling. I had a beloved aunt by marriage, the sole survivor of an Austrian Jewish family, whose travels saved her from a terrible fate during World War II. Her stories, which I hope to incorporate in a future novel, made me realize, even as a boy, how fragile and improvised our realities are. Even among unlettered and semiliterate people who came from villages and neighbouring states to work in Calcutta as itinerant workers—or among the waves of refugees who drifted to Calcutta after traumatic events across the porous eastern border of India—there was a strong tradition of gathering together to tell stories, usually variations from the great epics that everyone knew in detail—but also from folk traditions and family stories, laced with comedy, annals of unbearable losses, of travels planned or serendipitous. When I travelled to the United States as a wide-eyed scholarship student, I listened to very different anecdotes and stories, and found incredible similarities and variations of the ones I had heard back in India. The stories of wandering incognito princes in the Mahabharata and the lyrics of Woody Guthrie, the irreverent belly laughs inherent in Indian Pandavani variations (impromptu dramatic performances based on acerbic sung variations of old stories—a rural Indian tradition), and the sharp, quirky humour of my (then) newly discovered musical hero Eddie Cantor made for a heady mixture in my immigrant head. I was also becoming increasingly aware of the nuances and differences of storytelling in the East and West, between the lyrics of the blues in America and folksongs of East and West Bengal, for instance. I just wish I could have a conversation with Pete Seeger (who went to India and actually spoke to a number of my friends!) about ways in which stories get told, and songs get born. Later in my professional life, I came across amazing strands of stories wherever I went, in Jamaica, Ecuador, Kenya, Thailand, Greece, Argentina. People, everywhere, inherit and live stories, telling them to survive and make sense of themselves. I wonder about the stories the boat people will tell. What is your own ethnic identity? Are you a mix of two or more cultures? You live in both the United States and India—do you consider yourself equally Indian and American, or one more than the other? I found out about my “deep ancestry” through the National Geographic’s Genographic Project that my “deep ancestors,” who came out of Africa (like the rest of humankind) and roamed all over northern Europe, made a wide loop through Eastern Europe and the Russian steppes before heading off towards the high Hindukush mountains and the precarious Himalayan passes into India. All this from two cheek swabs of my DNA! And I understood how our common histories are those of travel and hybridity. Robert Aherne senses and muses about all this in his letter to his grandson Neel, which Devika reads. My paternal grandmother, with her chestnut hair and blue eyes, is a mystery woman about whose ancestry my swarthy grandfather was famously silent. My green eyes are an anomaly which often left me discomfited as a boy in Calcutta. One of my daughters is part-Scottish. My own existence in the two countries, one of birth and one of migration, makes me proudly and inevitably hybrid. Billy Swint has an interesting, tough voice. With his staccato rhythm and short sentences, his is different from the voices of other characters in the novel. It also has elements of stream-of-consciousness and poetic writing (the repetition of isthatyou?). Was Billy’s voice a challenge for you to write, or did it come easily? Is it inspired by anyone or anything? Echoes of voices I had heard, in AA meetings in church basements, in a psychiatric unit in an upstate New York hospital where I had worked, are woven into Billyspeak! Billy spoke to me. His tribe haplessly wander the corridors of each school district. Can you talk a bit about the words at the opening of each section? What do they mean to you? As I was writing the different sections, I felt the need to gather the different braids of narrative under individual epigraphs. All these epigraphs—which I put at the start of each segment—come from a single poem by W. B. Yeats, “Sailing to Byzantium.” In the complex music of this poem, which is about time and identity, places and journeys, art and artifice, I found phrases that exactly—and magically—capture the quintessence of the various segments. Let me give an example: A long segment—in which Kush grows up in Bengal during the crack-up of India, finds and loses his twin, and is marked by the magical presence, stories, and death of Kalo Pir—has the epigraph “Singing masters of my soul.”. The title of the entire novel also emerged from this one amazing poem. There was no other title I could even think of considering. Why did you decide to end the book with Devika? Did you consider ending with someone else? Devika has the sweet moral strength and emotional grounding to be able to withstand and rise above the bitterness of her parents’ traumatic end. It is appropriate that (in the Bengali manner) Kush sometimes called the child Devika “Ma”— that is, “little mother”; in India, a girlchild is often affectionately called that because she will be the mother of future generations. We also see how Devika has grown from a child into an adult—like some other women throughout the novel, such as Maeve, Bibi, Mrs. Aherne—but Devika balances the novel on the Mitra side of the story. In Devika’s child, the family lines come together. Did you know all along while you were writing the novel that the murders of Devika’s parents would come about at the end? Were you writing towards that event or did they come to you late in the novel as you were writing? Given my particular family history—and my experience as an immigrant in America—I have been aware of the trauma that precedes and underlies each tale of migration. All our families have such stories. And this was a theme I wanted to explore. When I came across a report in the New York Times about a troubled young man who killed an immigrant couple entirely by mistake, returning drunk to his childhood home in a murderous rage, I tried to imagine not just what could motivate such anger but also the antecedents of the protagonists over several generations, in a narrative entirely of my own imagining, situating them in real events of the periods they would have lived through. My own memories of various travels, actual events, and readings seeped into my telling of this story. Kalyan Ray's family was uprooted from what later became Bangladesh. Educated in India and the US, he is the author of the novel Eastwords and has translated several books of contemporary Indian poetry into English. He has lived and taught in several countries on four continents, and currently divides his time between the USA and India with his wife, the Indian film director and actress Aparna Sen. This sprawling novel gives new, multilayered meaning to that old cliché, “It's a small world.” Ray’s American debut is all about connections—and disconnections.... The variegated colors, tastes and textures of Ray’s narrative, as it moves through multiple points of view, lends a powerful sense of context to both the most trivial and the most tragic of human circumstances. Ray treads the fine line between coincidence and contrivance with bravado and finesse. "[A] compelling answer to a primal question: where do I come from?... Readers fond of Salman Rushdie’s subcontinental epics should appreciate Ray’s combination of multigenerational saga and historical canvas, taking in the potato famine, the partition of India, and the Triangle Shirtwaist Factory fire. Ray vividly illustrates the sentiment one of his characters puts down in a letter: '“We all stand at the same great isthmus in the geography of time. We are all related: Our mortality is our one common nation.'" Told from multiple perspectives, this thoughtful novel offers a panoramic view of the way personal and national destinies collide, sometimes ending in tragedy, sometimes in triumph. Historical fiction fans will find much to savor in this rich portrait of the trials and tribulations of immigrants. [W]renching... This compelling tale of cultural interconnectedness is highly recommended. An unforgettable journey through lives, continents, and history, No Country leaves you deeply moved. Kalyan Ray shows both the thrill and trauma of immigration in a true and powerful way. A wonderful book. 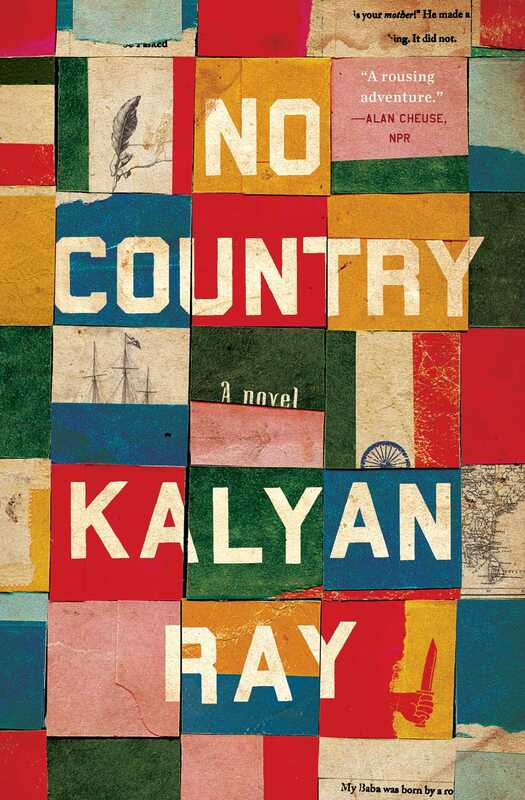 In No Country, anambitious, fascinating and suspenseful novel that spans continents andgenerations, Kalyan Ray deftly draws the reader into the lives of an unusualcast of characters who inhabit worlds as diverse as 19th century rural Ireland, colonial India and present day New York. Ray has painted these characters witha loving intricacy that made me truly care about their hopes, dreams, andtragic reversals of fate. This beautifully written, intelligent novel probes the nature of family, nation, and home—of the loyalties and allegiances which comprise identity itself. Beginning in a poor Irish village in 1843 and ending in upstate New York in 1989 by way of India, the story spans many generations and three continents to weave a panoramic tapestry, the very fabric of how we are all connected. This is a moving and compelling tale, full of richly satisfying ironies, and driven by a near-cosmic grasp of how fate and free will play out through our lives.